Have you heard the news? Christa Nardi has launched a new cozy mystery series. The first book, Prestige, Privilege & Murder (A Stacie Maroni Mystery) is already out. Definitely worth checking out. I turned and ran to my car, still crying. After a few minutes and a little calmer, I drove to my empty townhouse. Thankfully, I didn’t get stopped by a police car or have an accident. It wasn’t that late – a little after midnight. That’s what I told myself as I called my best friend Jillian. I didn’t get any farther than “I hope it’s not too late” and I burst into tears. My brain kicked in and I realized Rick wasn’t talking – it was the other man on the step. The balding stocky one in uniform with a scowl on his face, a smoker from the odor wafting off of him. And then I realized Rick was in uniform, too. He still looked good and gave off the woodsy scent. I sat on the sofa, my head in my hands for I don’t know how long. I still held the business card and reached for the phone. Time to call this Detective O’Hare and then Jillian. A whole list of people to call came to mind. There was silence as I waited. No elevator or perky music when you’re on hold for the police department. The call disconnected. That’s about how I felt. Disconnected. I called Jillian, but the call went straight to voicemail. I left a message that I needed to talk to her immediately and asked her to call no matter what time. What I really wanted to do was climb back into bed and hide under the covers. My stomach growled and my head hurt. Rocky Road is not the best choice for dinner. I tossed the eggs and ate some cereal but didn’t taste a thing. Who identified Ted’s body? Who killed him? Why? Other than me, who had a motive? I was dressed for work, but no longer planned on going there. I called and told Rosie, the receptionist, that I had a family emergency and wouldn’t be in. With another two hours before I’d need to leave for the police station, I started to make lists. Sooner or later someone – probably me – was going to have to call Ted’s family. Hopefully, they would take charge of the funeral and burial. Maybe they had a plot for him at the family gravesite. In ten years of marriage, somehow those topics had never come up. Excerpt from Prestige, Privilege and Murder (A Stacie Maroni Mystery). Copyright © 2018 Christa Nardi. All rights reserved. Christa Nardi is an accomplished author of cozy mysteries. Christa’s background is in higher education and psychology, much as her protagonist, Sheridan Hendley in the Cold Creek mystery series. Murder at Cold Creek College is the first in this series set in a small, fictitious town in Virginia and Sheridan is an accidental sleuth called on to assist the detective in charge of a colleague’s murder. The fifth and last in the series, Murder and a Wedding, was released on August 10, 2017. Sheridan may be moving, but she still gets involved in mysteries. Look for the first in the Sheridan Hendley series in 2018. 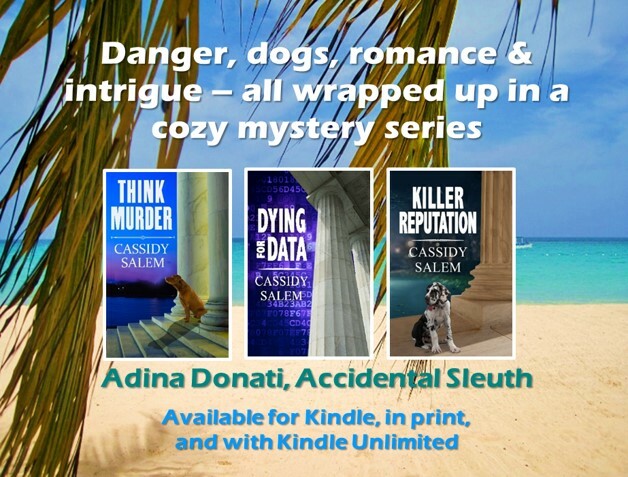 Thanks Cassidy for the spotlight – much appreciated!